Enhanced Outdoor Lighting & Design is family owned and dedicated to excellence. 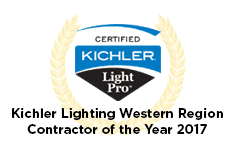 We are your solution for all LED outdoor landscape lighting needs in the Austin and San Antonio area both residential and commercial. Our mission is to deliver superior service, keep the customer first and use the highest quality in LED outdoor landscape lighting the industry has to offer. Our LED fixtures have a 15-year warranty or 40,000-hour lamp life. Our ‘retrofit’ or upgradeable, replaceable LED lamps have a 6-year warranty. One of our experienced designers will meet with you at your home and walk your property listening to your ideas and expectations. Then the design plan will be made, approved, and installed followed by a nighttime inspection to make any minor adjustments necessary. Our team is dedicated to excellence. For a free consultation call the experts at Enhanced Outdoor Lighting & Design today and let us enhance your beautiful property. 210-585-7909 or 512-359-0071. We handle all aspects of design and installation for your outdoor lighting.